Morning Commute, or They Let You DRIVE? One of the things I've needed to resolve in this new year is to be more intentional and habitual about my daily devotional time. A good book, a good passage of scripture, a good kick in the pants to get me thinking and pondering and meditating. I'm moving that way, trying to daily use my time in the morning when I first get to work to boot up my laptop and to approach God - when I'm wide awake, ready to hit my day, with everything in the open. Rev. 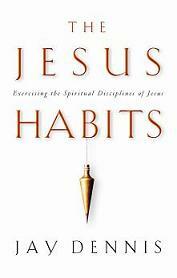 Jay Dennis has written The Jesus Habits (copyright 2005 - Broadman & Holman, publishers), looking at "what would Jesus do?" from a better beginning question: "how would Jesus live?". The thirty-one "habits" are things that Dennis noticed as patterns in the life of Jesus on the earth, things like Prayer and Obedience and Giving, but also Confrontation, Listening and Seclusion. The establishment of thirty-one habits makes this book a fairly easy choice as a month-long devotional, and it is very accessible to those who might be new Christians, or those looking to watch how someone as influential as Jesus was intentional about what He did and the way He lived. For the most part, the book is setup as a series of sermons - easily read that way, having the feel of a powerpoint presentation at times, and that's a problem for me. While there is a great deal of information and encouragement, it is usually presented in more of a cookie-cutter style that makes everything too homogenized. I would have enjoyed something more challenging and embracing, somehow drawing the reader into Jesus' life rather than simply displaying some of His daily routines. But that's probably the strength of this book, too - its simplicity. Where I might find fault, another would most likely find something worth emulating and striving for. For a more in-depth look at spiritual practices, however, I'd recommend Richard Foster, Dallas Willard, J.I. Packer, A.W. Tozer. But I would recommend Dennis' book to anyone who just doesn't know what Jesus did and wants to learn "The Jesus Habits", and who wants to discover more than what tradition and the status quo might be passing down through church circles today.